It’s a smoothie kind of day today! Actually, most days are smoothie days for me, especially Mondays. I make one almost every morning, and I don’t see it changing anytime soon. 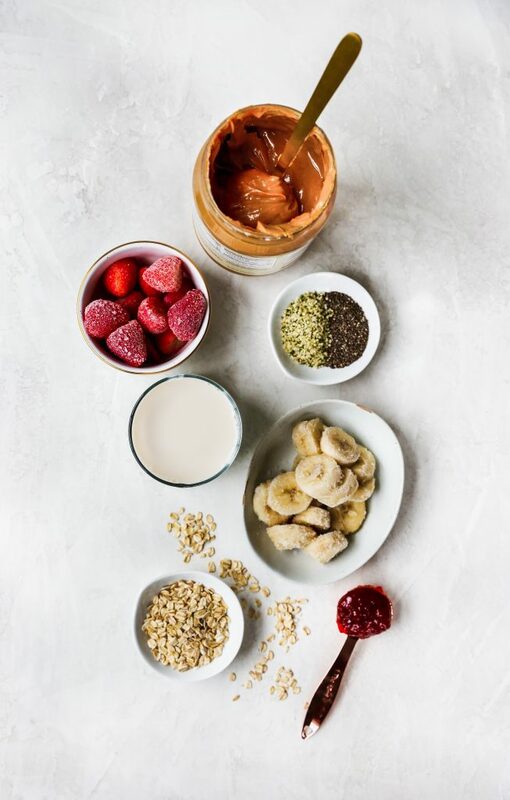 I love smoothies because they’re quick and easy, and they can be a nutritional powerhouse to kick start the day. 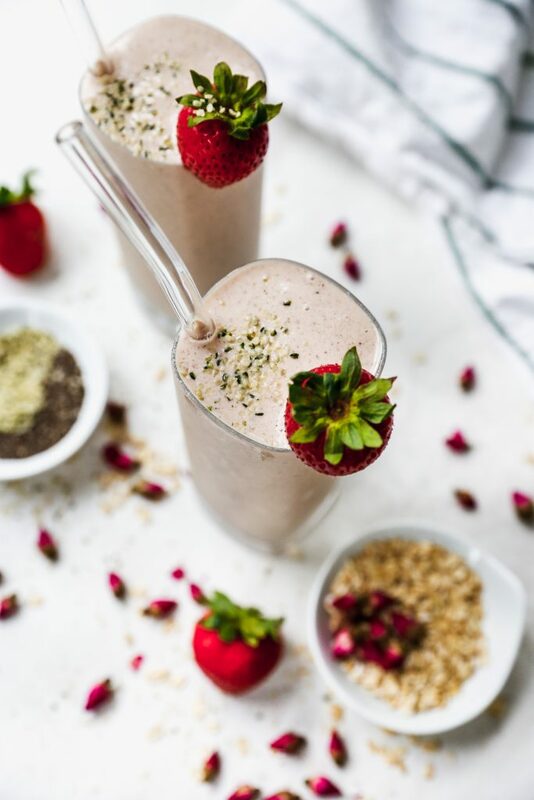 My most made smoothie is of the green variety – I love adding a couple handfuls of baby spinach to fruit/almond milk smoothies because it’s an easy way for me to ensure that I’m getting at least one of my servings of veggies first thing. And it doesn’t involve eating a salad! Nothing against salads, of course, but the extra boost a green smoothie gives me is undeniable. Today’s smoothie has been in my rotation lately, and while it’s not green, it still brings home the health. It straight up tastes like a PB & J milkshake! So I know you might be thinking “who need another smoothie recipe?” And I get it. The Internet is chock full of smoothies of all varieties. But one thing I promise to myself (and to you!) is that every recipe I choose to share with you all has to be amazing. Sometimes I don’t think a recipe needs sharing because it may not be anything out of ordinary, or like today’s example, it’s something that’s been done a thousand times over. BUT! 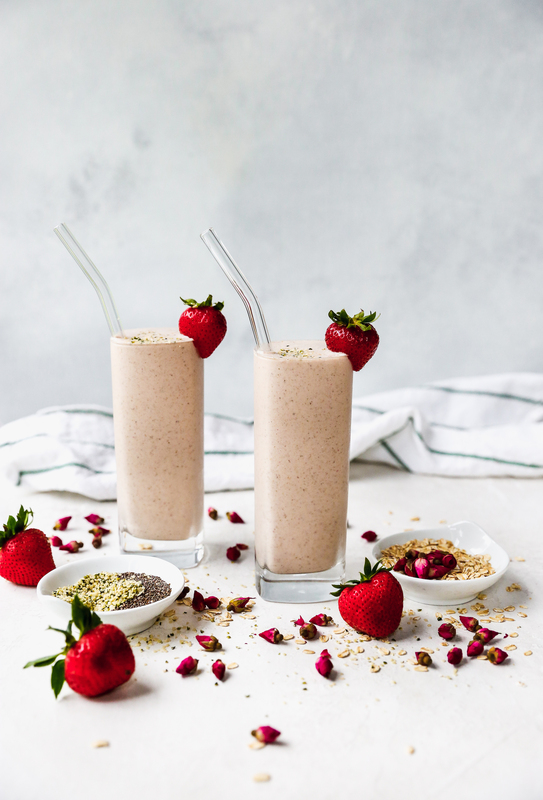 This smoothie is so freaking delicious, I bit the bullet and decided to share it with you anyway. It’s just how it works out sometimes. 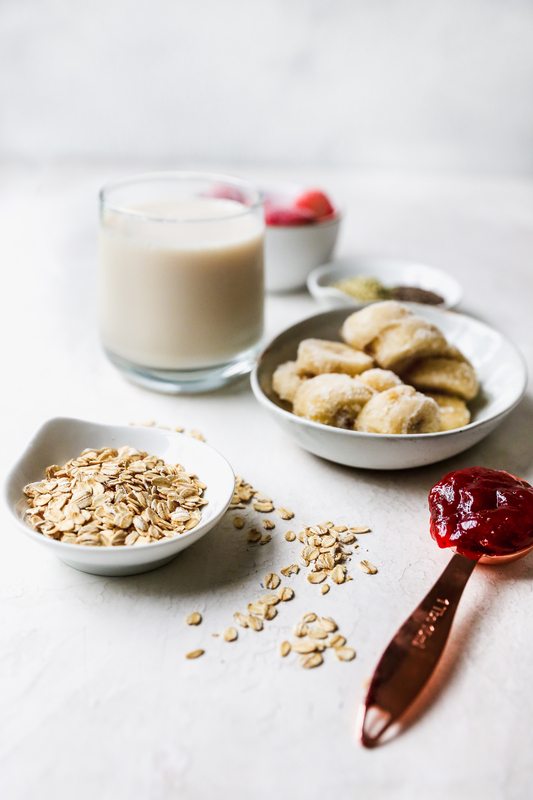 This smoothie is loaded with delicious PB&J flavors, along with some superstar ingredients you wouldn’t normally sandwich between two pieces of bread. We’ve got vanilla almond milk (you can use any milk you like), peanut butter (duh), frozen sliced banana, frozen strawberries, oats, hemp seed, chia seed, and if you’re feeling like things need a touch extra sweetness, a spoonful of strawberry jam. It really takes the whole PB&J thing to a new level. It all gets whipped up in the blender with some ice, and if you’re like me and constantly struggling to get enough protein, some of your favorite protein powder. I always use Vital Proteins collagen peptides. Not only do I get a dose of collagen and protein, but it is completely tasteless in anything you add it to. It also doesn’t have a chalky texture AT ALL. I highly, highly recommend it if you haven’t already tried it. It’s amazing. A game changer in the protein powder world. 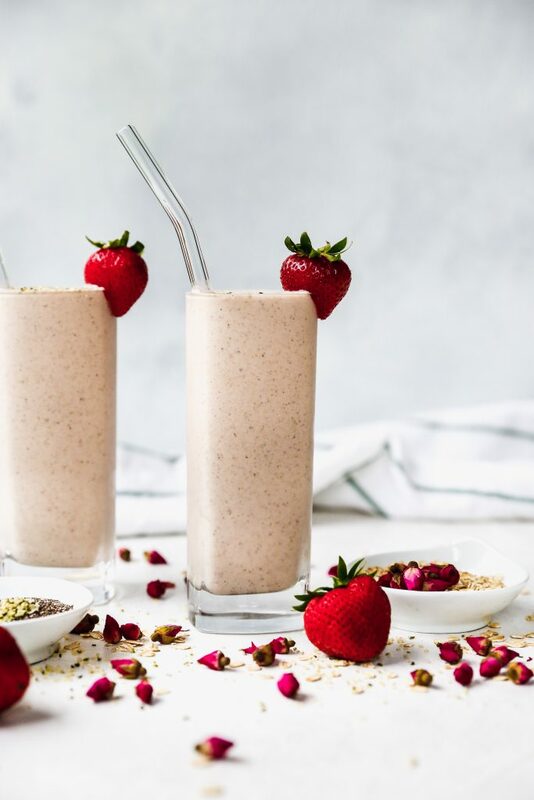 The resulting smoothie is thick and luscious and tastes super decadent, like a milkshake! The frozen banana and a lot of ice ensure this every single time. So, cheers to your health! And I guess Monday? Sigh. In a blender, add the ingredients, except the ice, in the order they are listed. Blend on high until smooth and creamy. Add the ice, as needed, to thicken up the smoothie. 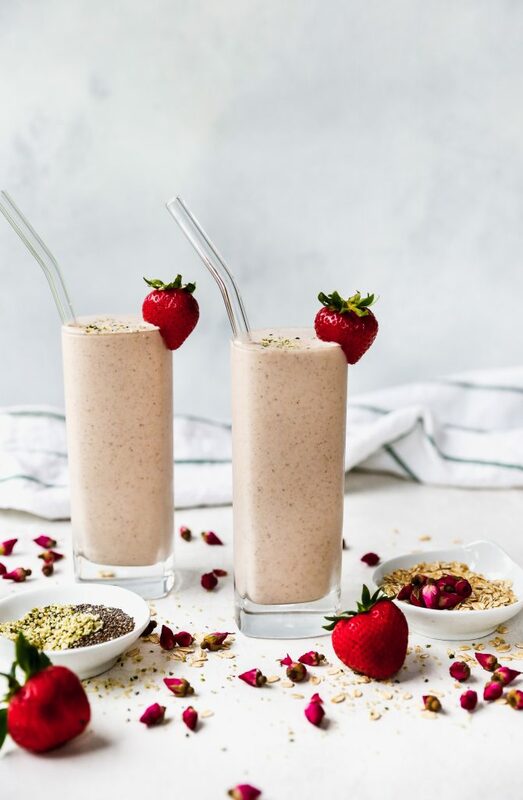 Serve immediately, garnished with a sprinkling of hemp seeds and sliced fresh strawberries, if desired.